Former world champion Shaun Murphy was knocked out of the Champion of Champions event in Coventry by 15-year-old Chinese amateur Yan Bingtao. 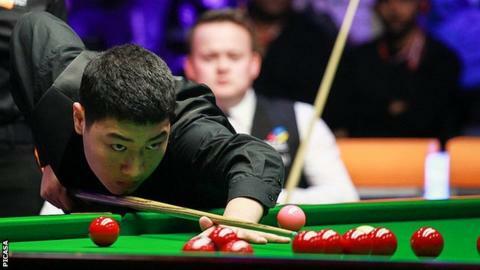 Yan, who is still at school, secured a shock 4-2 victory over the 2015 Masters winner and 2005 world champion. Murphy described his opponent, who had a top break of 74, as "potentially a great player in the making". "Shaun is a tough opponent so I had nothing to lose and that took the pressure off," the teenager said. Yan, who plans to turn professional next year, added: "I loved the atmosphere and I was proud of the reception I got. It was my first match in the UK and I really enjoyed it." The Chinese player was later knocked out by Australian Neil Robertson, who beat him 6-3 to set up a semi-final against Joe Perry. The 41-year-old from Wisbech beat four-time world champion John Higgins in an 11th frame decider in his group final.